I guarantee you will not put this book down without first wiping tears from your eyes. 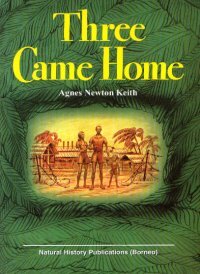 Three Came Home by Agnes Newton Keith is a first-hand account of life in a Japanese concentration camp in Borneo during World War II. Recently, TCM ran the movie version of the book and I decided to read the book prior to watching the movie after I discovered it was a true story while watching the title credits. After reading the book, I don’t know that I will be able to watch the movie as the story, written on cleverly concealed pieces of scrap paper during the three plus years the author was imprisoned, is one I would rather not watch. It would be tough for me to ever erase the mental images in the book much less to watch them. Mrs. Keith was imprisoned along with her husband and very young son. Her strength, fortitude, and courage while in captivity are inspirational. As I read the book, I kept thinking how much I admired this woman and others in the story. Their suffering in time of war was very great and yet, they chose to rise above it as much as was humanly possible. Not long ago, we celebrated Veteran’s Day and reading a story such as this one really strikes at the heart of why it is cause for celebration. War is a horrible thing. As the author writes, “In wartime, the cause of humanity is lost”. Agnes Keith was someone I would have liked to know. She was a writer before, during, and after the war. A truly remarkable woman. I am grateful she had the courage to tell her story and that of the others in the prisoner of war camp with her. While we have more than we need on this continent, and others die for want of it, there can be no lasting peace. When we work as hard in peacetime to make this world decent to live in, as in wartime we work to kill, the world will be decent, and the causes for which men fight will be gone. This entry was posted in Uncategorized and tagged Borneo, Keith, WWI. Bookmark the permalink.